Coaches Corner is your resource to assist you to help your players get the most from their LBYSO experience. Effective Fall 2018, Cal South requires all coaches in affiliated leagues to be licensed by US Soccer. This is a 2-hour online course. LBYSO reimburses the fee. Register here for the online 4v4 course through Cal South. At the bottom of the page, search for Coaching Classes and look look for the Online Grassroots 4v4 course. Fill out a LiveScan form. Click here for more info. The fee is reimbursed. Email RiskManagement@lbyso.org if you have questions. The Department of Justice prohibits organizations from sharing live scan information. Only the organizations requesting their members get their live scan will receive any subsequent information if a member’s live scan status changes. So, although we understand than many of our members have been live scanned for law enforcement, military, or school districts, they will also need to get it done for CalSouth as a youth organization. This is a free online course offered by the CDC here. LiveScan must be completed prior to receiving a roster. NOTE: These are one time requirements and do not need to be repeated every season. As a token of appreciation, coaches will receive a 50% credit for their child’s fee. The credit will be given at the end of the season and the coach must complete the season. If you not a parent but were recruited by a parent to coach, the credit can be given to the parent who recruited you. If they’re nice, they will give you a kickback. New coaches should seek out practice and game plan information. Online material, books and other coaches are among the many sources you can use. Ultimately, it is up to you to decide what is most effective for you and your players to learn to work as a team and improve individual skills while keeping things fun. U12 Rec and up play Can South Intercity League and download rosters from Cal South. For JUSA games, these are available on the JUSA site. LBYSO Recreational coaches are encouraged to seek out help to avoid carrying the entire load themselves. LBYSO typically issues a limited amount of equipment, usually balls and cones. Consider what other equipment you might need – goal(s), extra balls, practice jerseys/pinnies, first aid kit, etc. Don’t be shy about asking parents to pitch in for the basics. Ask parents to have players bring a ball to practice. Get a team roster with parent phone numbers and emails and establish a normal line of communication, especially for last minute practice and game updates. Pick a practice day/time/location convenient for yourself but also convenient for the greatest number of team parents. 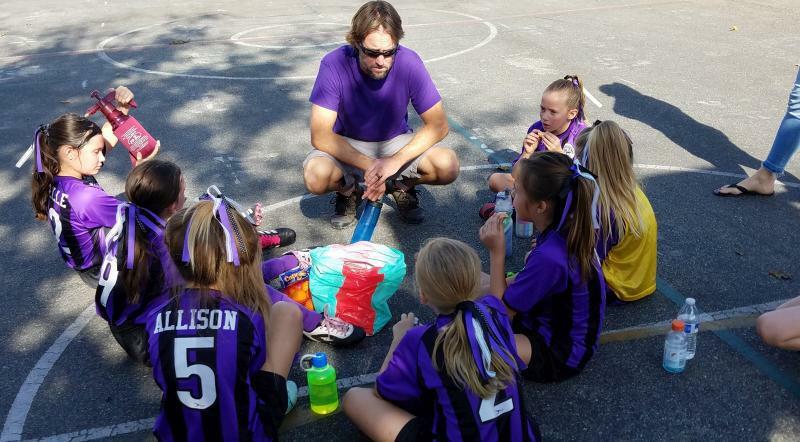 Recruit another parent to act as Team Manager who would handle side duties like uniform pickup, team banner, game day snacks, picture day, and anything else not directly related to the practices and games. Team Managers also require Live Scan background check. The fee is reimbursed. Recruit another parent to act as assistant/emergency coach when you are not available. Set up/Tear down – Check schedules to see if you have setup or tear down duties. Setup includes fields lining and goal/flag setup. Tear down is the return of both goals, flags and field lining equipment to the storage shed. Two sideline coaches max. No coaches behind goals in U10 and above. Play guidelines – Each age group will adhere to current US Soccer Player Development Initiatives effective Fall 2018. Or you can see the LBYSO summary here. There are slight variations allowed that are subject to change. Weather – Games will be played in light rain or drizzle as field conditions allow. LB Parks and/or LBYSO Board members will have final say in determining when to close fields. Appropriate efforts will be made to communicate conditions via the website and social media platforms.